Romanian society has witnessed an unprecedented tragedy in its recent history. More than 50 lives were lost as a result of some deficiency of integrity in the way the Romanian administration serves citizens. This tragic reality creates a horizon of expectations in society which went beyond its immediate causes and which cannot be ignored. At the same time, it assigned a moral mandate to the political parties democratically elected in the Romanian Parliament to give confidence to a government formula outside the established political practice. This Cabinet’s programme for Government must respond to these realities and find solutions to take effect both in the limited time of the current mandate and to lay the foundations of future developments in the structure. This Cabinet cannot and will not assume to engage on all reform fronts in Romanian society. But this Cabinet do assume a set of concrete measures, limited in number, but with systemic impact and relevance, that it intends to account for, by the end of mandate, to political forces and the society. First of all, this Cabinet will ensure the organization of election scheduled for 2016. The whole Romanian society expects an electoral cycle different from past ones. Politically, a respite is needed for political parties to define their programs and teams for the election race. Citizens themselves should increase their interest and involvement in the social life of the communities they belong to, so that they can participate actively, and be better and unbiased informed about the electoral process. The task of this Cabinet will be to create the necessary framework, neutral politically in which these structural preparations take place. At the same time, this Cabinet will create the appropriate organizational framework for the unfolding of electoral processes in optimal conditions, for all Romanians, irrespective of where they are. This Cabinet will search creating the optimal mechanisms of informing the political environment regarding the executive or legislative measures it is about to take. The same logic will apply to all social partners, towards whom this Government will show transparency and openness by establishing some innovating systems of consultation and exchange of ideas. Last but not least, the Government will test and implement new work methods regarding the internal functioning of the central working unit(Government and Ministries), in its attempt to leave by the end of its term of office, a series of viable alternative solutions for the well – functioning of the administration. With respect to the priority economic policies and areas, the major objective of this Cabinet is to strengthen the macroeconomic parameters, the prospects for consistent development of our country. In this respect, the Government will focus on identifying and eliminating vulnerabilities in the absorption of European funds. The Government will start immediate contacts with all the European Commission’ services responsible for managing various financial instruments and will seek quick implementation solutions to remove deadlocks. 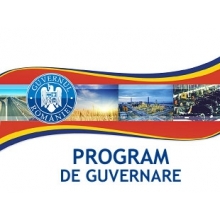 Infrastructure investment will be a priority, viewed as the prerequisite for unlocking Romania’s investment attractiveness potential; stage of the ongoing projects on all pan European sections (road and railway) will be assessed in order to speed up their unfolding. With respect to European agenda and foreign policy, Romania should stand firmly in the current geopolitical context, increasingly complex and difficult. The political cohesion within the EU has been eroded by profound crises over the last year: the euro currency one, the UK challenge to the current system of treaties, the unprecedented crisis of migration towards Europe, or the large –scale terrorist attacks that took place in France. All these crises have exposed gaps in legal and institutional architecture of the Union, to be solved through completion of the integration process in areas such as: the single market, common currency or the operation framework of the Schengen Area. At the same time, they have revealed major outlook differences between states or blocks of states and, against this background, political trends of populist -extremist nature have gained increasingly larger electoral relevance and in a growing number of European countries. As the 7th largest state in the European Union, Romania must not witness passively the great essential debates to be held in 2016. Romania should choose its negotiation strategy regarding Great Britain’s requirements, and must fix its position in the migrants crisis management, in European policy reformulations that will inevitably appear in the next 6 months, at the level of Schengen operation rules, either on border protection, migrants integration or common asylum system. Romania will pursue its national interests in all these debates, and at the same time, will promote the values and key- principles that laid at the foundation of the European Union. This Cabinet will search contextual alliances with those Member States with common visions on these topics, and will maximize its vote within the decision –making process. At international level, Romania is at the confluence of global phenomena with profound consequences in national or European agenda of the country. The strategic partnership with the United States has been and remains the central landmark of Romania’s foreign policy. The Russian Federation’s policy in the Eastern neighborhood of the European Union, and of Romania, generates continual instability, with lasting effect, to which Romania must find suitable responses and strategies. The conflict in Syria and the EU relations with Turkey, about to be fundamentally recalibrated, will create opportunities for foreign policy that Romania will have to manage carefully both in formulating positions at European level, and in bilateral relations.